Flee You Disgusting Mangy Currs! “Very good, then,” muttered Hasan, watching as the statues made way. “The blessings of Ilsundal,” the elf whispered, as he gently opened the skeletal fist and removed the scroll. “The Siswa are taught to respect the innocent dead, and bury them with their own treasure,” the elf intoned to nobody in particular, “but the Quiet Way never saw the Siswa in place like this, I don’t think.” The elf picked up the wand too. Feldard glanced back towards the gnolls, wondering if they would charge up now, figuring it was safe since the party wasn’t fleeing for their lives. Just in case, he shut the door behind him. Stephan shuttered at the sound of the closing doors. Feldard, he thought, did not seem affected by stony chamber. As the elf moved about the room to raid the corpses, Feldard kept close watch on the statues for any ill movement from them. Stephan looked at his comrades and knew he would lose the argument. “Paush luva kornnin,” he muttered in defeat. “This is a dark, windowless cell full of death. But full of comrades!” He tried to smile. Seeing the far door to the bridge tower, Stephan carefully made his way to it, keeping an eye on the statues. He tried the door and found that it could easily open. Looking carefully at the statues, he pushed one door open enough for him to pass. Still with sword and shield in hand, he stepped out onto the other side of the bridge. The gnoll war party was still assembled below. Upon seeing him, there was a great commotion. Stephan could see the shock and terror even in their hideous faces. Lifting his sword in triumph, he bellowed in goblin, hoping they’d pick up some of the words. “Your mighty foe is dead by our valiant swords and magic! Flee you puny gnolls before we bring death upon you too! Flee you disgusting, mangy currs! 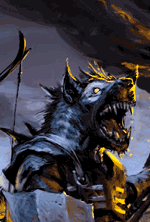 Or we shall bother to come down and bring you a large serving of pain and death!” He mixed in some common tongue that was generally understood by even gnoll types. At his words, he could see that the gnolls were confused and frightened. A few of them, he noted, seemed to be translating bits of his speech. A great many in the front ranks began to push back. There began a great turmoil with much yipping and snarls as panic began to set in. To help them along, Stephan slowly lowered his sword from the upraised position to point at the mass of gnolls. As he did, the panic mounted and several of the beasts tumbled or were pushed into the torrent of the river. Miklos sighed, it might have been better to let them assume we were dead. Either way it was too late now. Perhaps it might help their cause? It probably would sew some fear amongst them that the party had power over the guardians of the bridge. He returned to his studies of the wand. And the elf went outside to add his greetings to the gnolls to Stephan’s. After two nearly lethal spears from the dogmen, the elf was ready to taunt from safety. After some time, the gnoll clanhead and his bodyguards seemed to take control of the situation. After barking some orders, the gnolls rounded up the small group of ogres among them. At spear point and boar head, the gnolls forced the four enslaved ogres into the tunnel entrance. The four ogres, were followed by a dozen gnolls who held five large boars by their leashes, who were to ensure that the giants would not turn back. The ogres were clearly not happy about their predicament, but they had no choice in the matter. They climbed the stairs upwards toward the bridge. Ludo turned to Stephan and Hasan “well this is a fine mess you have got us into”. Grabbing his rope and grapple he swings it up and skilfuly secures it to the top of the runined tower. Lets get on top of this tower and slay these Ogres when they get bow range. If we are lucky maybe the two golems will help us”. The priest hefted his shield back on. “Lord Halav, grant us good fortune.” He climbed up the ruin and prepared the defences with Ludo. He glanced nervously at the bridge and hoped his lightning bolt wouldn’t fracture the bridge instead of bringing the roof of the tunnel down. But they had little choice he had to delay them until they were well into the mountains, and whatever lay beyond. Two great forms of ogres emerged from the shadows and behind them the snarls and wolf cries from the tunnel. “Cover your ears!” shouted Miklos. With three swift cutting gestures with his hand he barked a word of power. A blinding flash and an ear-splitting crack silenced the gorge. The ground rumbled with the vibrations of falling rock. A cloud billowed out of the tunnel mouth. Shards of splintered rock spun out and scattered across the bridge. The dust settled the two great ogres lay prostrate at the base of the rock fall. Miklos sighed with relief. and turned away. ”I think I caught a few in there, lets hope they don’t think of a way around it.” Miklos stopped when he saw Maruc’s face. “What is..?” he turned to the the ogre’s picking them selves up.